In a country with 1.4 billion people, even small declines generate huge impact. The health of the Chinese economy is becoming a big worry for some international firms. 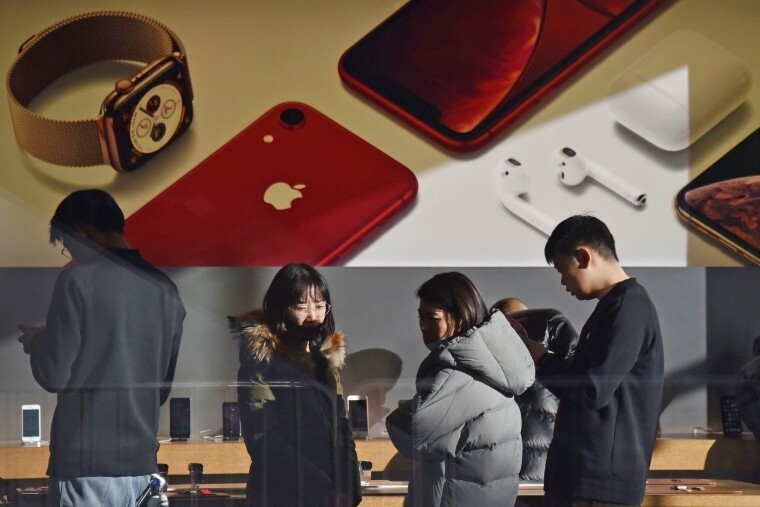 Buffeted by the ongoing trade war between Beijing and Washington — not to mention an already-anticipated slowdown in domestic growth engines — the world’s second-largest economy has drawn negative commentary out of sectors ranging from consumer technology to autos. On Wednesday, Apple CEO Tim Cook cut his company’s revenue forecast, laying some of the blame on falling sales in China and the trade war that has levied high tariffs over the last several months across hundreds of different products and commodities sold between the world’s two largest economies. Stocks in Asia traded mostly lower on Thursday and U.S. futures pointed to another volatile session for Wall Street following Cook’s comments. As the trade war tariffs continue to take their toll — despite an agreement between President Donald Trump and his Chinese counterpart, President Xi Jinping, not to apply any new levies during a 90-day negotiation period — there are plenty of signs that China’s growth is slowing. The Chinese Academy of Social Sciences, a government-led think tank, recently cut its growth estimate for China’s economy from 6.5 percent this year to 6.3 percent. While that seems like a small difference, it signifies a big drop in consumer spending when spread out over the country’s 1.4 billion people. “We did not foresee the magnitude of the economic deceleration, particularly in Greater China,” Cook said in a letter to shareholders Wednesday. Intel Chief Financial Officer and interim Chief Executive Officer Bob Swan said on an earnings call in October that “China is a big market for us,” adding that the company was working with customers and suppliers to adapt to any new tariffs. “It’s going to be a wait-and-see as we go into 2019,” he said. “We obviously continue to assess the situation and the potential impact on our business and our plans that we may or may not need to make as a result — but again, we’re not chasing ghosts, but we’re also not sticking our heads in the sand either,” he said of the trade war. The tariffs have already cost U.S. automakers, especially Ford, whose CEO Jim Hackett complained earlier this year that the tax penalties on steel and aluminum were costing it $1 billion last year alone. That pain has been exacerbated by a slowdown in car sales in China in recent months. Auto sales there fell 14 percent in November over the same month in 2017, according to the Chinese Association of Automobile Manufacturers. Ford’s sales in China fell more than 30 percent during the first 11 months last year compared with the same time frame in 2017. In November, Ford’s China sales fell more than 50 percent over the same month in the prior year. Tesla, meanwhile, is speeding up construction of a factory outside of Shanghai and has cut prices on some of its models in China to try to offset the trade war’s impact on sales there. The company said it was operating at a 55 to 60 percent cost disadvantage to local manufacturers in the country. Wells Fargo analyst Ike Boruchow told investors Wednesday there are high levels of uncertainty around potential new tariffs in 2019, raising fears that the rhetoric between the two governments will lead to a backlash against American brands that operate in China. This has already played out between China and Canada: Chinese consumers were reportedly boycotting the Canada Goose brand due to the recent tension between the two countries. Retailers are getting hit particularly hard on China-related news, even if the impact hasn’t quite hit their bottom line. Tiffany’s shares fell 9.6 percent on Nov. 28 after the jeweler released disappointing third-quarter sales that were hurt by weaker spending from Chinese tourists in the U.S. and Hong Kong. The luxury jeweler’s earnings were in line with estimates, but revenue of $1.01 billion was shy of the $1.05 billion estimate from analysts surveyed by Refinitiv. Target said in September that it was “deeply troubled” by the Trump administration’s escalating trade war, saying it threatens to undermine the U.S. economy, penalizes American families and raises prices on everything from backpacks to playpens. The trade war hasn’t impacted all U.S. companies equally. Lululemon and Nike have cited China as a bright spot in recent earnings reports. Nike sales there grew by 31 percent during the company’s fiscal second quarter that ended Nov. 30. Lululemon, Starbucks and other retailers have fared better by partnering with local companies in China. China is also the world’s fastest growing aviation market, and a slowdown would hurt aircraft manufacturers and carriers, although it hasn’t affected them so far. The International Air Transport Association, an industry group representing commercial airlines around the globe, has said it expects China to overtake the U.S. as the largest aviation market in the world by 2022. So far, the industry mood has been upbeat. In September, Boeing, the world’s largest commercial aircraft manufacturer, raised its estimate for the number of planes China will need through 2037 by 6 percent to nearly 7,700, planes worth some $1.2 trillion. Luxury retail and product companies, meantime, are at risk of losing a valuable set of customers should Chinese sales slow. Chinese shoppers are expected to account for 45 percent of the luxury market by 2025, according to a recent study by consulting firm Bain. So far, the effect has been slight. Sales of Estee Lauder’s premium cosmetics in China slowed to 4.4 percent in November, down from 7.8 percent in July, according to analysts at Jefferies. Executives at luxury goods maker LVMH told analysts in October it is seeing only a modest decline in demand from its Chinese shoppers. Still, fear of losing Chinese luxury customers has rattled the market nonetheless. LVMH executives in October said Chinese authorities are enforcing regulations around luxury importation with more strength. That acknowledgment sent shares of luxury companies worldwide skidding, including Gucci owner Kering SA, and Prada and Shiseido.